Goal: To phase out operations at Venoco’s Ellwood onshore oil and gas processing plant and protect the surrounding natural and recreational resources. Photo courtesy of Erin Feinblatt. In 1966, ARCO installed Platform Holly, located in State waters approximately two miles offshore UCSB and Ellwood Mesa. 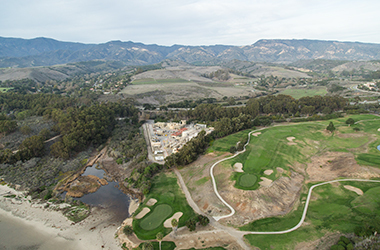 Oil and gas produced at Holly was transported via pipeline to be processed at the Ellwood Onshore Facility, located between the Sandpiper Golf Course and Bacara Hotel. The oil was then put into a pipeline and transported approximately nine miles up the coast to the Plains Pipeline system and delivered to refineries. Up until 2012, the oil used to be transported out of the County by marine barge, causing significant risks of oil spills and air pollution. However, due to the critical work of EDC and our clients, Venoco finally stopped transporting its oil in this manner, thus ending all marine shipping of oil produced in California. In 1991, we secured the rezone of the Ellwood Onshore Facility to Recreation, and the facility operated as a nonconforming use. It is inappropriately located near popular recreation areas such as Haskell’s Beach, the Ellwood Mesa and monarch butterfly preserve, Sandpiper Golf Course, and the Bacara Hotel. Over the years, Venoco’s operations have resulted in significant impacts to the community and the environment, and in 1999 the State Lands Commission temporarily shut down Platform Holly following a series of dangerous gas releases. The risk of an oil spill remained an ongoing threat to the Devereux Slough and the University’s Coal Oil Point Ecological Reserve, home to the federally protected snowy plover and other important seabirds. Since 1997, EDC and our clients have been working to defeat Venoco’s plans to expand drilling from Platform Holly and extend the life of its operations for decades. When the Plains pipeline ruptured in 2015, operations at the Platform were shut in. In 2017, Venoco declared bankruptcy. By the end of the year, Platform Holly and all of Venoco’s offshore leases were quitclaimed back to the State, and the Ellwood Onshore Facility is now scheduled to be shut down once Platform Holly’s wells are all plugged.